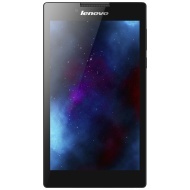 alaTest has collected and analyzed 529 reviews of Lenovo A7-30 A3300. The average rating for this product is 4.7/5, compared to an average rating of 4.3/5 for other products in the same category for all reviews. People really like the screen and size. The performance and price also get good feedback. Some have doubts about the touch screen. We analyzed user and expert ratings, product age and more factors. Compared to other products in the same category the Lenovo A7-30 A3300 is awarded an overall alaScore™ of 86/100 = Very good quality. Pretty good tablet for the price and size. These were bought for my children for apps and videos and have so far worked fine. A lot better than the hudl that they had before. Could be a bit better with the screen response. Can't turn off the vibrate when pressing the buttons.
" Great little tablet, good value. " " It is a good tablet especially for the price of it. It has a sharper screen resolution and better mega pixel camera than the pricier tablets around. Very happy with this purchase. " Great tablet for the price, we have a Nexus 7 as well but that didn't like the upgrade to Lollipop 5.1, so purchased this as it still uses Kik Kat 4.4, and with the additional Micro USB slot it runs perfect. An excellent tablet in a compact size. I feel that Lenovo could have supplied a cover although one can be purchased as an extra.Once again excellent service and delivery from John Lewis.
" Bought for my daughter. Would b pleased with it myself. Did lots of research this came on on top. " " Brought this as a gift for my dad who is not very good on modern technology he has found it so easy to use its light and easy to take away with you great features and great camera. Would highly recommend. " " My daughter has had this for 5 months and no problems as long as you are carefull on what apps are downloaded, we had a couple of minor problems after my daughter downloaded a couple of games but it was soon sorted. We would recommend this product. " " I would deffinetly recommend this to others. Great tablet for growing youngsters... "